After trying for some time to get Blogger to accept the post below without them sending me error messages, I found that this picture had been inserted below the ‘cake’ picture. 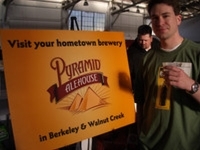 I have never seen it before or heard of the Pyramid Alehouse and can only assume that the pic arrived courtesy of a crossed line. Still, if anyone from the Alehouse cares to send me a a few bottles of IPA ….